Quicken Loans offers a huge range of mortgage options including refinance loans, FHA, USDA, VA loans, jumbo loans and more. Quicken offers a large range of mortgage and refinancing loans, including reverse mortgages, specialist VA and USDA mortgages, refinancing options, and a unique YOURgage option. Quicken promises to use cutting-edge technology to guide borrowers to the best loan product and complete the loan approval process quickly. Quicken stands out for offering home equity loans for almost every possible scenario so that you can find a suitable home financing package speedily, whatever your needs. Quicken is best for almost anyone, thanks to the massive range of loan options. It's especially easy to compare among the options that Quicken loans can offer you. Quicken’s fixed rate loans include an FHA fixed-rate loan for first-time buyers with under 20% down payments. There’s also a traditional 15- or 30- year fixed-rate loan that requires a minimum down payment of 3% and a Jumbo loan that is expressly tailored to borrowers needing loans of over $453,101 up to a maximum of $3 million. Quicken’s Jumbo, fixed-rate, and ARM loans are all available on special VA loan terms to eligible veterans too. Quicken presents an almost bewildering array of loan features. Fortunately, there are also plenty of tables and mortgage calculators to help borrowers identify the best loan. All of Quicken’s loans permit monthly, bi-weekly, and automatic loan payments to help you keep on top of your budget. Quicken runs a quick credit check and shows you initial quotes within just a few minutes. Quicken provides real-time updates about the progress of your loan so that you’ll always know how much longer you have to wait. You’re invited to schedule the closing date of your loan online and choose when and where to close. Quicken can send you all the paperwork online, too. You’ll find an appropriate loan option with Quicken, no matter what. Quicken’s application process is fast and almost entirely online and the many educational resources help everyone make an informed decision. On the other hand, the range of loans on offer can just be confusing and bewildering. Although Quicken does offer many calculators and guides to help borrowers decide, many people will find it easier to call and speak to a representative. And, while Quicken does offer live chat as well as phone and email support, there’s no round the clock help and no single FAQ section. With Quicken, you can choose between a number of 5- year or 7- year ARM mortgages, a 15- or 30- year fixed rate mortgage, or a fixed-rate mortgage with a term anywhere between 8 and 30 years. APR rates change daily, but Quicken always shows today’s rates clearly on the site. For today's rates, visit the Quicken Loans site. Quicken offers customer support via phone, live chat, and email, which is refreshing, but none of those are manned 24/7. They are open longer than regular working hours, with live chat available until midnight on weekdays and 8pm on weekends, while telephone support in English and Spanish can be accessed until 10pm on weekdays and shorter hours on the weekends. Quicken Loans mortgage rates start lower that it's competitors, though J.G. Wentworth's maximum rates top off a bit lower, and Magnolia Bank's top rates are lower still. All three lenders offer a variety of loan terms and low down payment requirements for some loans, giving you options with any lender you choose. Quicken Loans and Magnolia Bank both allow 50% or higher debt to income ratios, though keep in mind this will depend on your credit ratings overall. Budget accordingly, and carefully consider if such high debts will allow comfortable repayment on your loan. All three lenders here have entirely online platforms for your convenience and customer service needs. Quicken's APRs for conventional loans do beat out the competition, and the website is upfront about the required deposit fee. 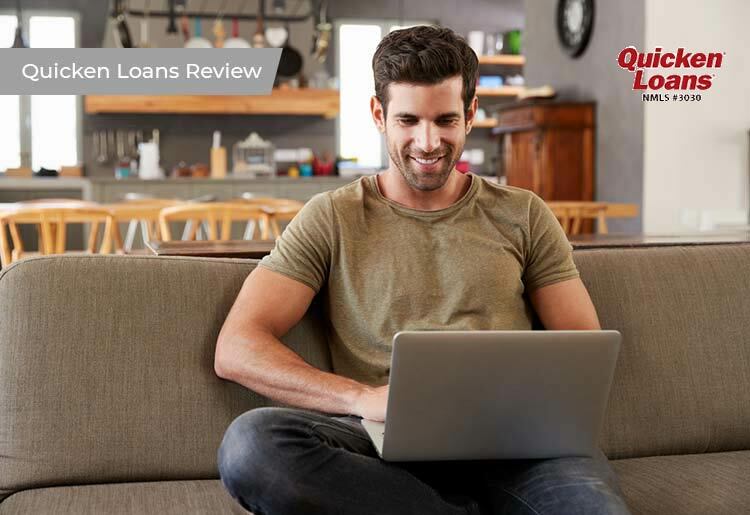 Overall, Quicken loans offers a lot of choice for home equity and refinancing loans with fast approval, low APR rates, and plenty of useful educational resources. The ability to choose between so many different loans, including those for specific needs, is valuable and so are the educational resources throughout the site.